Overdubs & remix postprod by M.D. 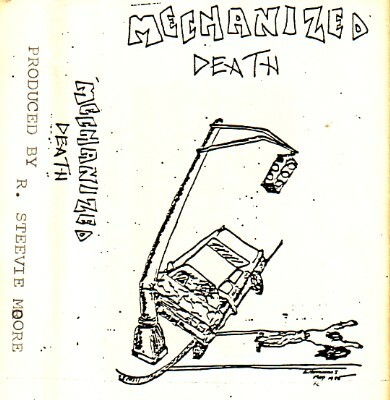 Mech Death would like to thank absolutely no one at all except for the following: R. Steevie Moore, Gene (our bodyguard bouncer roadie supreme), Chris and SchMegan (Gidget goes punk), Chet (Eddie Van Halen goes punk), Carrie (Buffy goes punk), John Groves in the dark (Punk goes Mechanic, BMW even! ), Sacred Denial, NJ Head Bangers, The Queebes, Crazy Rhythms, All the girls at CVS, Mike from B.S. Monthly (the Zine that's full of it), Ian MacKaye, Saturnine, anyone whoever lent Jon a guitar, anyone whoever came to see us, anyone who gets this tape, and anyone we missed. big thanks to Harry Baggs for photo at top and reconnection process.